The Raft of the Medusa (1818-1819) is an impressive oil painting that is 16 feet by 23 feet by French Romantic master Théodore Géricault (1791-1824). The painting, which hangs in the Louvre in Paris, portrays the twisted bodies of the dead and dying on a raft built from the shipwreck of the French naval frigate Méduse. 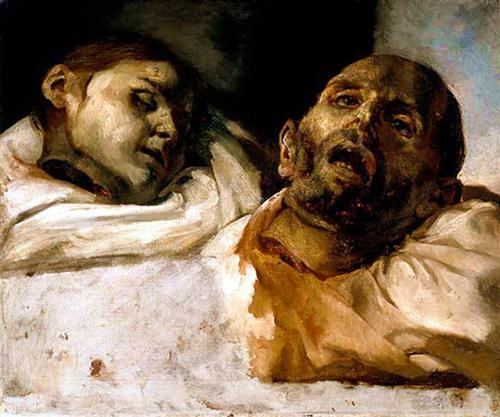 To prepare for painting the carnage depicted in his masterpiece, Géricault studied and painted decomposing body parts he obtained from morgues and hospitals. On June 17, 1816 the Méduse departed from southwest France for the Republic of Senegal in West Africa. The frigate ran aground off the coast of modern-day Mauritania, just north of Senegal, on July 2nd. Some of the survivors decided to construct a raft out of the wreckage because there weren’t enough life boats. After the raft was completed about 150 of shipwreck survivors were set adrift on July 5th. While they were lost at sea most of the raft’s passengers died, and the rest suffered dehydration, starvation, and practiced cannibalism. When the survivors on the raft were rescued, 12 days later on July 17th, there only 15 people of the 150 alive (Puchko 2015). The accounts of the survivors were well publicized and caused a scandal in French politics. The shipwreck inspired Géricault and he took on the project of recreating the disaster for a painting that he submitted to the Paris Salon in 1819. To prepare for the impressive scale of this work Géricault interviewed survivors, travelled to the coast to study the skies and seascapes, and sketched and painted preparatory paintings (Théodore Géricault, Painter 2000). Géricault also took advantage of programs at local morgues that let art students check-out human remains like library books for anatomical study (Ebenstein 2012). He took heads and body parts back to his art studio turned “body farm” so that he could watch them decompose. 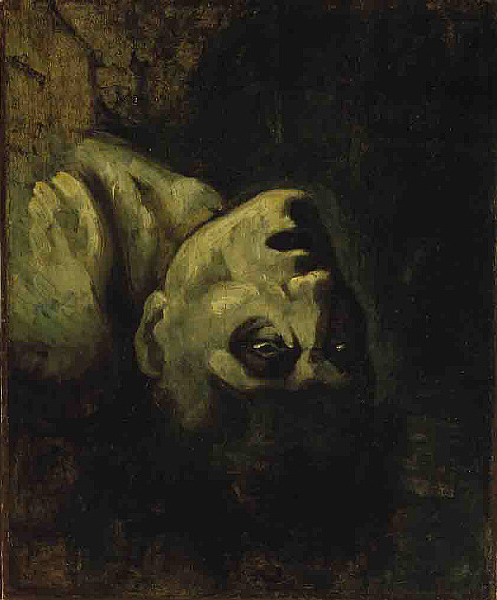 Géricault kept one severed head on the roof of his studio for two weeks and painted it as he watched it decay (Théodore Géricault, Painter 2000). This head, rumored to belong to a thief who died in an asylum, was used in multiple Géricault paintings. He used these dismembered remains in some preliminary paintings of which only a few exist today: Study of the Heads of Torture Victims (1818), Head of a Guillotined Man (1818), The Head of Drowned Man (1819), and Study for the Raft of the Medusa (Larson 2014 and Ebenstein 2012). 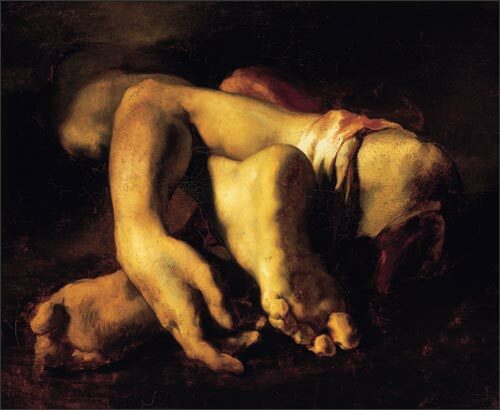 After Géricault’s death in 1824 the contents of his studio were sold, in the catalogue for that sale there is a listing for one lot of 10 studies of human body parts (Larson 2014). Heads of Torture Victims (Study for Raft of the Medusa) (ca. 1818). Image Credit: WikiGallery. Head of a Guillotined Man by Théodore Géricault (1818) at the Art Institute Chicago. Image credit: Peter Eimon on Flickr. Larson, F. (2014). Severed: A history of heads lost and heads found. New York, NY: Liveright Publishing Corporation. The picture of the survivors was the inspirations for one of Julian Barnes ‘Ten and a half chapters’ in his history of the world! Thanks for putting it into context.